A 1 Day Kagulu Rock Hiking Adventure is a thrilling climbing encounter for nature lovers. 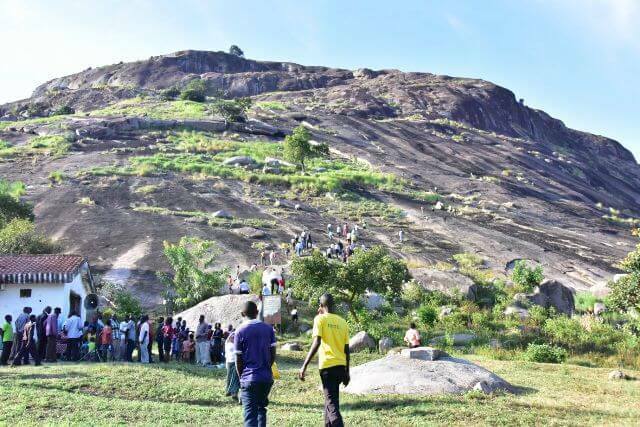 Kagulu Rock in Kamuli district is among the tourist detsinations in Uganda for underatke climbing or hiking adventure challenges. Standing at a hieght of 10000 feet about the sea level, the Rock is explorable in a day from Kampala. A one day tour to this exclusive rock in Busoga region starts from Kampala and ends in the evening. The drive to the tourist site take about 4 hours. This hiking trip is one the 1 day tours in Uganda mainly starting from Kampala. Wake up early morning, have breakfast and let our ready driver guide pick you up from an agreed place to start the trip. Drive along Kampala-Jinja Highway going through Mukono, Mabira Forest to Jinja town. From Jinja, drive towards Kamuli district and then proceed straight to the foothills of the rock. On arrival, get all the neccessary hiking gear includding hiking shoes, stick if needed and good clothes. You will then get briefed about the adventure and then start the trekking. The hiking is is challenging but enjoyable. According to the Busoga Tourism Initiative, Kagulu Rock is a spiritual marvel. It’s so because it’s believed to be the first settlement zone for Basoga people that wandered from Bunyoro led by the Prince Mukama. He settled here and made it his Kingdom headquarter because of its high elevation that permitted him to have great views of the adjoining areas. The hill is positioned between two roads at the foothill leading to Iyingo and Gwaya areas. The hill has been adapted for tourism with several rock hiking opportunities. One part has many steps up to the top for climbers to use. When you reach the hill summit, there is an outstanding 360 view across a stretch of green vegetation up to Lake Kyoga. After trekking to the top, relax there for a little while and then after start descending to the bottom of the hill. You then drive to Kamuli or Jinja town for lunch followed by a transfer to Kampala where you will arrive in the evening.